The project’s purpose was to address the issues in our schools and beyond our district such as bullying, acceptance, and gender equality through music and theater. We wanted elementary age students to be able to relate to the stories in Marlo Thomas’ musical collection of stories; Free to Be…You and Me and using these social issues they might be dealing with through music. We chose Marlo Thomas’ musical collection of stories; Free To Be…You And Me for several reasons. Our district was flooded with mental health issues, a recent suicide and social media bullying. Our history teacher also recognized that the LGBQT community needed a safe zone and so he reinstated a Gender Sexual Alliance. The Marlo Thomas 1974 musical themes still ring strong in 2018. 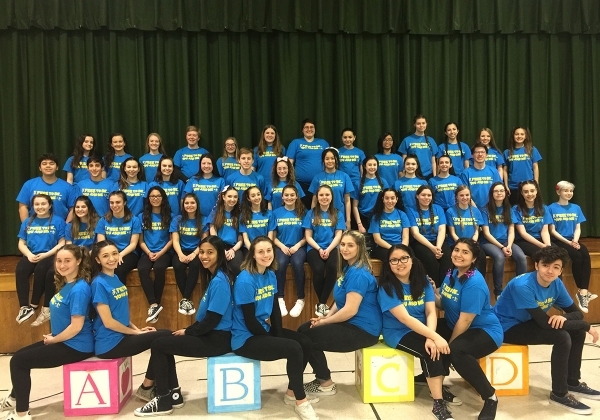 The entire Cedar Grove High School Music and Drama Department rehearsed the musical and then CGHS Music Matters helped organize a tour to five different schools. We collaborated with the Cedar Grove Education Association, Administration, the Board of Education. Faculty, Staff, and community members to bring this musical on tour. The CGEA received a PRIDE Community Organizing Event Grant in order to pay for the rights and royalties of the published musical. The parent boosters from CGHS Music Matters organized a caravan to transport our musical equipment and instruments to each tour location. Our principal and Board of Education paid for our tour t-shirts and buses for our music and drama students. The students and faculty worked together to formulate questions to lead a talk-back after each performance and the parent booster members organized a bake sale after our final community performance. CGHS Music Matters also provided a copy of the Free To Be…You and Me text, CD and DVD to each school we toured to. This enabled the elementary music teacher in each school to teach some of the music to their students before the performance. The concept of My Three Words was a year-long theme that the CGHS Music Department and CGHS Music Matters Group carried throughout each event and performance. The theme of three words that give hope, strength, confidence, advice, or what your values are. Free To Be…You and Me truly brought our music department together and we could not have done it without our CGHS Music Matters group. In June 2017, we proposed the project of the Free To Be You and Me tour to the New Jersey Education Association. We applied for a Community-Organizing grant to pay for the rights and royalties for the musical. We were granted the amount needed and began the process of ordering. In July and August we created lesson plans to share with schools that might be interested in having our tour performance. These plans were sent through Google Drive to the local principals to be shared with their staff. A letter was included that explained the project, the performance and possible dates for our tour. In September 2017 we began rehearsing the vocals of the musical in choir classes, the scenes in drama class and the accompaniment in band class. We incorporated the music into lesson planning once a week. We also sent the lesson plans and copies of Free To Be You and Me to each school that we were touring to. In January 2018-March 2018 we rehearsed more intensely each day and prepared for our touring performances during Music In Our Schools Month (March). We solidified dates for our tour and confirmed busing. Our principal used his fund to 􀂡nance the two busses and also our tour T-shirts. 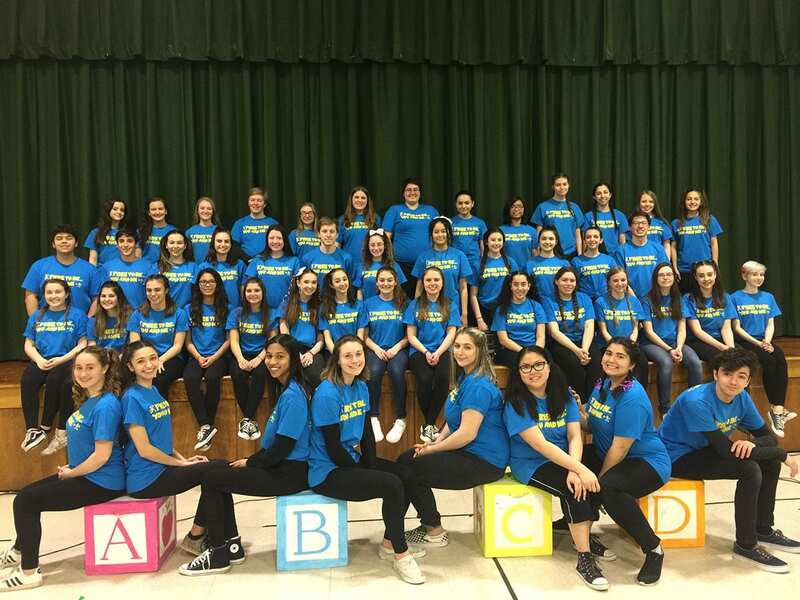 March 17-18-20-22, 2018: We toured to North End Elementary School, South End Elementary School (Cedar Grove, NJ) Verona Elementary Schools (Forest Elementary and Laning Elementary), Katharine D. Malone Elementary in Rockaway, NJ and a 􀂡nal community performance at Cedar Grove High School on March 22 at 7 PM. We had a reception sponsored by the Cedar Grove Education Association and hosted by Cedar Grove High School Music Matters. Free To Be You And Me was extremely successful at reaching our own high school students that performed and students outside of our district who were our target audiences. The talk back sessions were eloquently led by our high school students; they asked thought-provoking but age appropriate questions in which the elementary students responded with candid fervor. At our final performance, several parents and community members were able to see our tour performance that was held during the school days and then discuss with the cast and musicians how they felt about the whole experience. The elementary schools and our community members were able to see the power of music and theater performance on the social issues students deal with today and how it can evoke conversations and a safe zone for students to have these conversations. We had to apply for the rights to Free To Be You and Me from the Rodgers and Hammerstein library. Once we had the quote, we applied for the grant. We didn’t really have a budget for the project. It was something we really wanted to do so we applied for the Community Organizing Grant through the New Jersey Education Association. They provided $1,500. We ran into the obstacle of how to pay for the remaining expenses such as transportation for the tour, the rental fees and performance fees that went beyond our grant budget and the t-shirts for our performers. Luckily our principal Rick Mangili stepped in to help pay for the remaining costs. He allowed us to pay for the remaining publisher fees with the music budget, and then he used his principal’s fund to pay for the T-shirts and bus transportation. We also ran into terrible winter storms and school closings that forced us to reschedule ALL of our tour performances except one. This was a challenge with the coordination of our high school schedules and the bus company as well as the elementary buildings’ schedules. We measured the success by how the Talk Back sessions went. Each Talk Back was unique and effective. The target audiences asked questions based on the issues that were covered in the musical and also about our student performers. The Talk Backs provided us with insight on how effective we were in communicating in performance through music and in addition recruited future musicians and performers. The elementary students were excited, filled with confidence and singing along with us during the performance. Two teachers even incorporated the songs into their spring concerts. We feel all of these aspects prove that the Free To Be project was effective and a huge success. If you would like to do a musical tour project, I highly suggest budgeting through a few organizations in order to 􀂡nance all the elements from transportation which can be very expensive to a group t-shirt order that really polished the tour. Choosing the right material for a performance tour is also very important. We targeted elementary students and therefore chose educational material that they could sing along with, find entertaining and also bond with the high school performers.